LST: BIG downgrade overnight for Saturday swell. But still plenty NW action next 10 days & many minor SSW in coming weeks. Average Trade swell return this week. 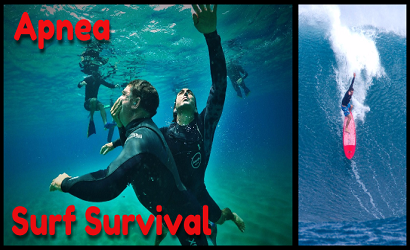 Powered by Hawaii Eco Diver’s Apnea Survival course. You will still Get $50 off! Military get $100 by mentioning SNN when dates next course gets set in April. Call or email Owner/Instructor/Master Diver Ricardo Taveira at 808-859-1148 or hawaiiecodivers@gmail.com to tell him who sent you and get your discount! Join the elite crew. HUGE downgrade on Saturday swell. The Low passes further North out of our window. JETSTREAM: Good. It’s pushing off Japan, broad & powerful with 180kt pockets and a mostly zonal flow. It does get past the dateline and nosing to our longitude of 160W by Sunday. There’s a large dip this weekend. Toward the end of this 7-day outlook we see the Jet intensify with 190kt pockets and getting past the dateline. The southern branch will have some time hovering over or near Hawaii then migrate to the East. The general picture suggests plenty surf well into April. In fact, next Friday-Saturday-Sunday gets Winter Caliber. Jetstream: Large scale ‘river of wind’ about 30-35,000ft in our upper atmosphere flowing west to east circling earth in both Hemispheres. It has major impacts on climate, weather, and airmass (Lows and Highs) which help form and steer storms that bring our waves. Recent-Current: Surf has been sizeable most of March with even some record-setting size surf. April looks to keep things going at least thru the first week. This past work week we had some smaller surf but Th-Fri it bumped to near 8’ at the peak. This latest episode was from 2 sources: a compact 45kt storm near N. Kamchatka last Friday into the weekend racing NE into the Bering Sea (the smaller pulse). Another more powerful Low took a similar fast NE track thus limiting the fetch length and swell produced. But it was closer and with higher seas. Thus, the biggest sets. They didn’t last long due to, again, the short fetch period due to the NE track. Our winds went to the bathroom but Saturday was great overall. Saturday saw tons of fun around the compass. A nearing front cut the trades and supported a N flow along with midday onshore seabreezes and glass off evenings. We’re in a semi funky and fickle wind and weather state into next week with one more front approaching Monday. But these fronts are also part of the swell producing lows. Forcing us to take the good with the bad. 1Next: Buoys popping late Saturday on the new WNW-NW with the NW Buoy at 7’17, Hanalei at 4’ 18 and Waimea at 3’ 18sec. A new Low came from a new spot in the WPAC, off Japan Wednesday the 27th and it occluded (slows and fattens) tracking slowly ENE to NE to N as it grows to 35-40’ seas. By Thursday it becomes a Beast with near 50’ seas created by some hurricane force winds. The system stays centered near 2500 miles NW so this will allow for plenty swell decay. If this system tracked SE toward us this would have created another 20’ NW at least. Its strongest winds don’t point right at us thus, we can expect to get long period 18 sec NW Sunday the last day of March with surf hitting 6-8’ maybe even nearing 10’ at Sunset since it jacks on long periods. Plus, with the lite SSE winds: perfect. It will drop to 5-7’ Monday with another front messing with the winds. Trades come back Tuesday-Friday when another front may near. 2Next: There’s a soft gale in close proximity ‘bubbling’ off from a Low near the central Aleutians into April 1st. WW3 projects some short interval NNW-NW by the Wed the 3rd up to 5-7’ and the return of NE trades. It will drop fast into Friday. We could see some 14 sec surf up to 7’ Tuesday from earlier stages of the large low. It’s a tricky one to predict. 3Next: A new eastbound Low with up to 35’ seas well off the Kuril Is. Monday the 1st will end up tracking NNE like the others above but still bring us some surf Friday the 5th. Right now well go with 4-6’ NW sets at 14 sec. It’s a bit far out and will likely need (foam ball) adjustments. 4Last: DOWNGRADED April 3rd Wednesday a Wintery Eastbound Low spawns further NE on our side of the dateline at 170w and ends up intensifying later than original model runs. It’s only by Thursday it got the 45-50’ seas but most its energy is pointed to the NW coast. 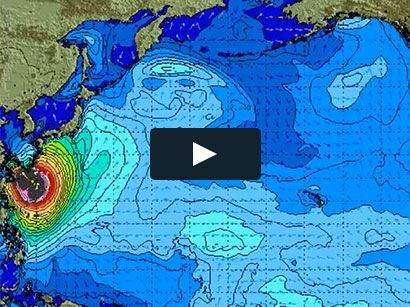 We did say ‘Surf may be overcalled by WW3 at this time’ with an original estimate of 12′ seas at 15sec! or 10-18’ surf Sat. the 6th. We’ll now go with surf at an 8’ peak of NNW at 13 sec Saturday. Which means it basically misses us, otherwise we’d see the long periods. it’s still early and WW3 may turn around but it’s low probability. This week finally caught up with last week in the grade dept. This past week, our Jetstream didnt look great. Tho’ there’s some 140kts, this is not usually enough energy for significant ground swell spawning at the surface. There’s a ton of High pressure surrounding New Z. The southern branch is mostly zonal but does bend ENE near 170West. 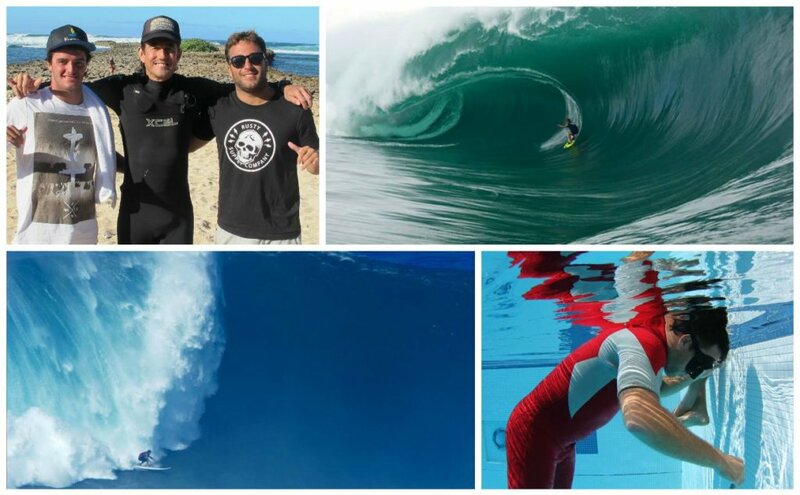 By this Sunday the flow is better and fatter with a NE meridional flow from 170-140west under Tahiti. Then, the Jet gets weak early April. Recent/current: Super fun SSW surf reached easy head high with lite N winds and perfect conditions till the onshore sea breezes took over before lunch. It’s been active in March with very few days if any being un-rideable. We had a new 15 sec SSW from a large zonal Low below New Zealand and by Thursday the 21st it tracked to longitudes straight South of Hawaii. 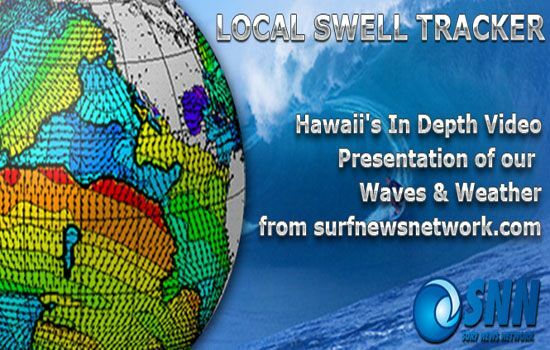 The deep swells only reached 1-1.5’ at Lana’i Buoy Thursday the 28th and thus max head high sets. But winds were terrible on shores. Next: The next pulse comes late today with 16 sec forerunners from another Low tracking ENE up off the Ross Ice Shelf Friday. Friday continued with some good 2-3’ surf with improving NNE winds post frontal passage. Sat. was pretty epic tho’ not at all big. An extra foot would’ve made a lot of difference. Next: Sunday, a NE bound Low bubbles off the prior storm’s tail Sunday the 24th for some follow up swell Sunday the 31st. It’s more of the same tho’ with surf expected reach 3’ with 16 lower 14sec into Monday even Tuesday. Winds Good again esp early and late. Last: A serious 30’ Taz Sea Low is seen tracking east Monday the 25th and all we might hope for is 0.5’ swells at 15sec filling Wed. the 3rd. This one’s sketchy. And there’s not much else but 2’ SSW background possibilities. Recent/current/next: The surfs been mostly a mix of N and wind swell up to 1-3’ for Windward shores earlier this past week at spots like Makapu’u. Trades were outta here overall so the surf’s way down to barely 2’ esp. Thursday the 28th. We see only minor variations into next week thanks to more fronts hindering fresh paced trades of Spring. Trade swell might re establish Tuesday-Friday but then another Front nears. TROPICS: Nothing new this week. Long range outlooks are often blurry. Finally, on Valentines Day, El Nino makes it official…The ‘Little Boy’ is here. El Niño has looked pretty “imminent” since October but wait no more. It’s a Happy Valentines Day for all the climate and surf forecast nerds. The National Oceanic & Atmospheric Administration (NOAA) announced Thursday 2/14 that after nearly 8 months of flirting with The Little Boy, the climate phenomenon finally stopped making us play the waiting game. However, before you get too pumped about surf potential and comparisons to 2014/16, this El Niño and its impact on weather & waves will be limited; it’s a weak El Nino. Scientists have been watching select zones of ocean temperatures of the eastern tropical Pacific known as the NINO3.4 region for more signs of El Niño. They now can officially declare it “game on” as the temperatures have met the threshold of 0.5 degrees Celsius (about 1 degree Fahrenheit) above normal for three consecutive months. Temperatures cleared this mark in October, plus models have remained bullish they’ll stay there into July. Early February, NOAA said sea surface temperatures in the region were 0.8 degrees Celsius or 1.4 degrees Fahrenheit above normal. NWS criteria for High Surf Advisories (first number) & Warnings (second number). All surf height observations & forecasts are for full ‘face’ surf height, or ‘trough to the crest’ of the wave. Terms: Eg. The split Jetstream is why all the Gulf and Alaskan storms are sending North swells. There’s that strong, persistent blocking ridge west of the dateline bumped the Jet up and over into the Bering Sea most November. 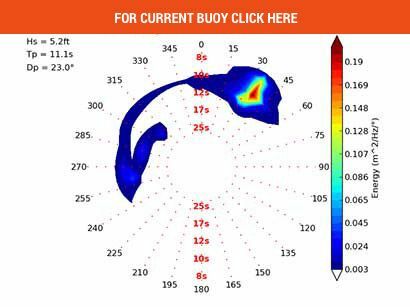 Note: The spectral density graph in the SNN Buoy Page (link below) shows slivers of forerunners that initial text readings do not ‘show’ till later on written buoy updates. Also, note the vertical graph is not ‘wave height’ rather its a measure of wave energy in hertz (frequency or cycles/sec) for the whole ‘band’ (the distribution of power/period in the total wave energy field/spectrum). Tropical depression forms when a low-pressure area is accompanied by thunderstorms that produce a circular wind flow with maximum sustained winds below 39 mph. An upgrade to a tropical storm occurs when cyclonic circulation becomes more organized and maximum sustained winds gust between 39 mph and 73 mph. A tropical storm is then upgraded to Category 1 hurricane status as maximum sustained winds increase to between 74 mph and 95 mph. (The highest classification in the scale, Category 5, is reserved for storms with winds exceeding 156 mph). Shoaling is the effect by which surface waves entering shallower water change in wave height (or grow) due to speed change (or slow down). Wavelength is reduced when going from deeper to shallower. The ‘energy flux’ must remain constant (nature’s liquid law) so the reduction in wave group (transport) speed is compensated by an increase in wave height (and thus wave energy density). Yeah, I know…waves are complex AND amazing. Refraction is the change in direction of waves that occurs when waves travel from one medium to another or depth change. Refraction is always accompanied by a wavelength & speed change. Diffraction is the bending & spreading of waves around obstacles (‘reefs’ and openings). High Surf Advisories & Warnings NWS criteria below in coordination with Hawai’i civil defense agencies & water safety organizations. ENSO (The El Niño-Southern Oscillation) is a single naturally occurring climate phenomenon in three states or phases. These involve fluctuating ocean temperatures in the equatorial Pacific. … When temperatures in the ENSO region of the Pacific are near average it is known as ENSO ‘neutral’, meaning that the oscillation is neither in a warm or cool phase.The two opposite phases, “El Niño”(warmer than average) and “La Niña”(cooler than average) require certain changes in both the ocean and the atmosphere because ENSO is a coupled climate phenomenon. “Neutral” is in the middle of the continuum. The MJO (Madden-Julian Oscillation) is an eastward moving disturbance of clouds, rainfall, winds, and pressure that traverse the planet in the tropics and returns to its initial starting point in 30 to 60 days, on average, unlike ENSO which is stationary. In a nutshell, a more active ENSO means more surf.